Map your teeth and write to the Tooth Fairy. Peppa will show you what to do. In fact, Peppa has just lost her own first tooth. Now it is tucked safely under her pillow – and she’s waiting for the tooth fairy to flutter by. Very simple words and beautifully bold illustrations: this reassuring read shows that wobbly teeth are nothing to be scared of. 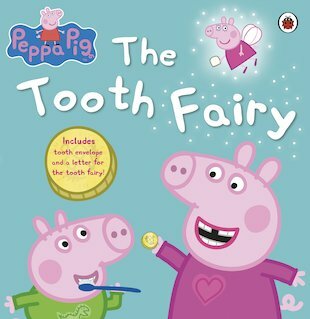 It includes a tooth envelope and letter for the tooth fairy, plus a tooth chart to fill in each time a tooth falls out. Plus: don’t miss Dr Elephant’s tips on looking after your teeth. This book brings to life a moment that every one experiences! I read it with my little brother and all these thoughts cam gushing back! A classic childrens read!